Of a generation ninety years ago. Cannot get anything for free. Words could find influence for me. Luis works in the mental health field in Los Angeles, CA. He was born in Mexico and has been published in online and print journals for the past two decades. His first book of poetry Raw Materials, was published by Pygmy Forest Press. 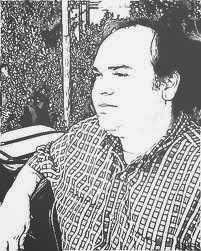 His other chapbooks and poetry books have been published by Kendra Steiner Editions, Polish Beat Press, Propaganda Press/ Alternating Current Press, Poet's Democracy and Dead Beat Press.